Atlantes and caryatids – we´ve already seen here – are anthropomorphic ornamental structures employed in buildings since classical antiquity. In most cases, they are responsible for the symbolical function of supporting the weight of the building. The difference between atlantes and caryatids lies only in gender – the term atlante is employed to male forms and the term caryatids to female ones. In Eclecticism these decorative columns met a great diffusion throughout Europe and the western world. In Brazil they experienced a lot of success. In Downtown Rio the 9 atlantes of former Cia. Docas de Santos – now IPHAN – still attract many people´s attention (left). What about the caryatids, where are they, after all? Maybe two of the most impressive examples in town lie one near the other, right there in Cinelândia. 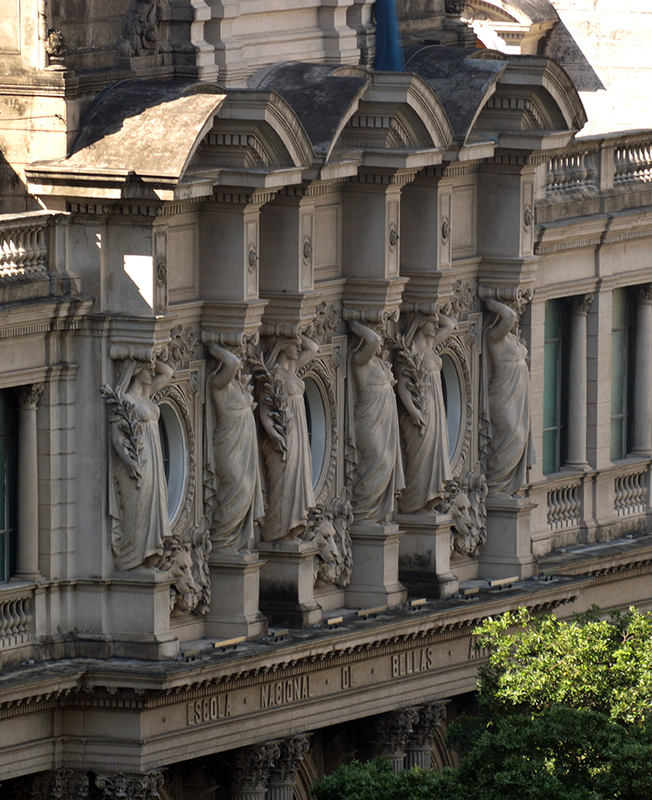 In the first example we have the 14 caryatids of National Museum of Fine Arts – or MNBA –, probably sculpted by the great Brazilian sculptor Rodolfo Bernardelli – six of which, facing to Rio Branco Avenue, are seen below. 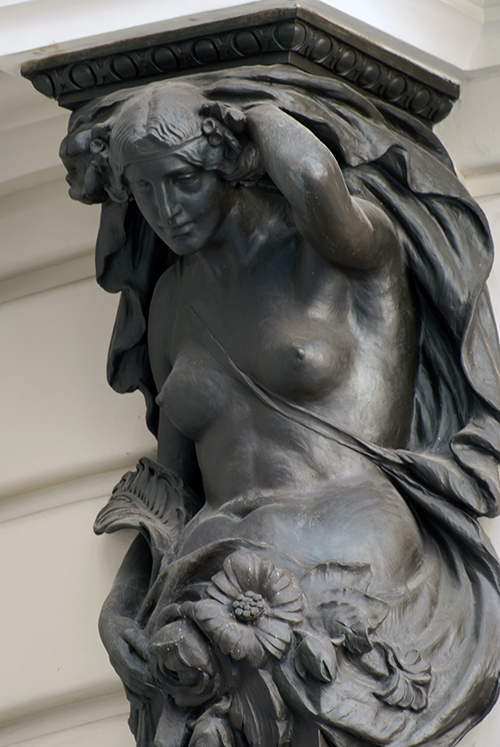 The second example – and the main subject to this already long post – are the 8 caryatids of the Rio de Janeiro Municipal Theatre, four at each side, which in perfect symmetry “support” the main façade´s rotundas columns. They represent the four seasons and can also be seen here (below). It is noticeable in some of them the artist´s attempt to escape the traditional representation of the four seasons typical attributes – an attempt, perhaps, to endorse the modern attitude of breaking with the past and the artistic tradition. Winter has its head and body warmed by the skin of a feline which it has eventually just captured. 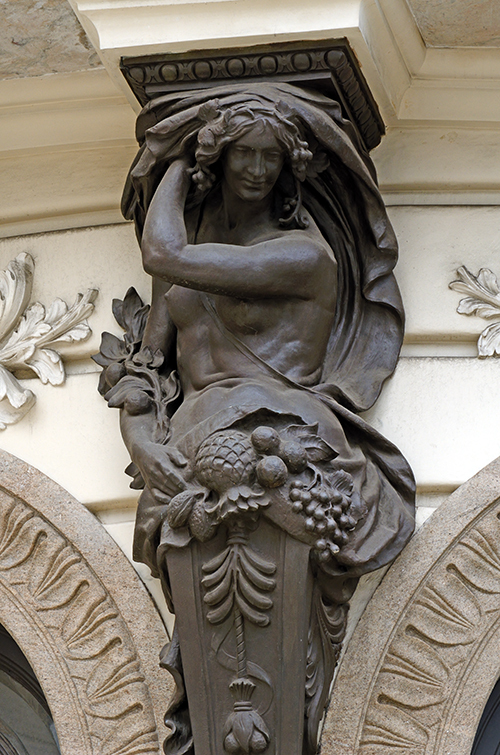 A smiling Autumn brings along the fruits of a profitable harvest – including the grape -, since this is the season devoted to Bacchus (Dionysus). The allegory of Summer below generally carries as attributes the spitfire dragon, a wheat beam or a scythe. Here it has instead the body covered by scales and carries in its left hand a sharp knife and a branch of another plant – will appreciate some help here, botanists of the world! Spring, finally, is wrapped by its most typical attribute – the flower -, besides the palm in its right hand, maybe a symbol alluding to life resurrection after Winter. 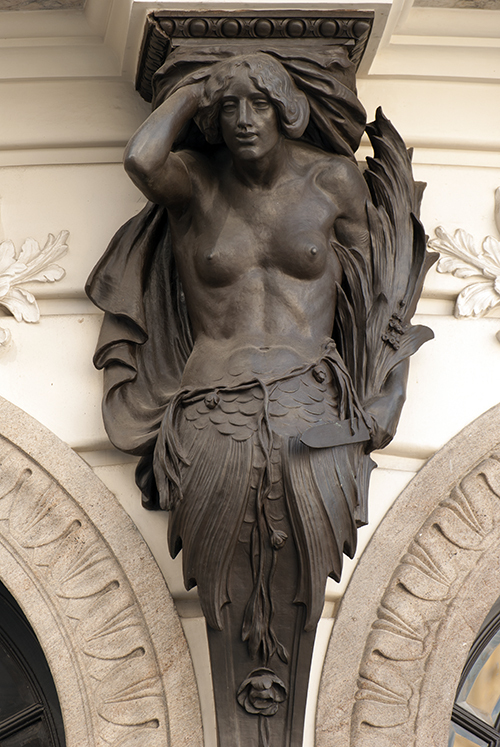 For those of you not yet annoyed I´ve put below four other examples of carioca atlantes and caryatids and their addresses, with special emphasis for the caryatid-Indian-mermaid of Itahy Building, by sculptor Pedro Correa de Araújo. Anthropomorphic is everything that assumes the human form. The term atlante – the reader may have already noticed – comes from the name of the Greek mythological god Atlas, who was condemned by Zeus to hold the sky on his shoulders all over eternity. Cela ressemble bien à une production “à la française” : ces sculptures sont belles et en bon état. Connaissez-vous ces deux à Paris (de la fonte de fer, pas du bronze) ? Fantastiques ces deux telamons que tu me présentes. Je recherche beaucoup à l´Internet pour trouver quelques caryatides comme celles de Municipal de Rio, mais sans aucun succès.